Bedelia by Vera Caspary ~ 1945. This edition: Blakiston, 1st edition, 1945. Hardcover. 187 pages. Vera Caspary has written a study of a psychopath as fluffy as eiderdown, a kitten whose claws were steel. Bedelia was everything to please a man – and she pleased many. She was small, cuddly; she smelled nice. She never argued or lost her temper. Her house, like her hair, was shining, her food delicious. She loved to cook, and she adored the gadgets of housekeeping. How strange that a passion for percolators and copper pans should help solve the curious riddle of her past! Irresistable prospect for an evening’s light read, I thought. Right from the first page I was a bit disappointed in the quality of the writing; no beautifully put-together passages here. Caspary, if Bedelia is typical of her work, was a straightforward, “then she walked across the room” sort of writer. Just the facts, ma’am. Even the “tense psychological” bits are reported in a straight-faced, take-it-or-leave-it manner. Bedelia and her new husband (and perhaps prospective victim?) Charlie posture and project all over the place, while I sat off in my spot as a not quite fully engaged spectator, figuratively yawning a bit and wishing they’d just get to the point, already. It felt very much like one of those melodramatic 1940s films where everything is so broadly telegraphed to the audience that we eventually become so hardened to subtle effects, which turns out to be an apt conclusion as I found out later that Vera Caspary was indeed a successful Hollywood screenplay writer from the 1930s to the early 1960s. 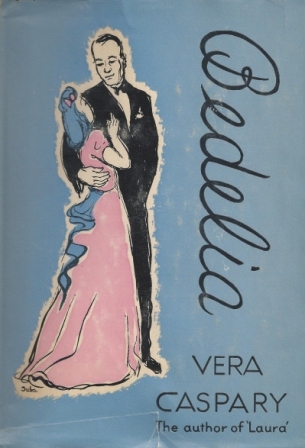 Bedelia is the tale of a besotted newly married man, Charlie Horst, and his adored bride, a beautiful and passionate young widow who gratefully clings to him and makes his life oh-so-sweet. She’s a marvelous housekeeper, an accomplished cook, a gracious hostess to his friends, lovely to look at (and smells good, too, as Caspary points out more than a few times) and, to Charlie’s greatest delight, she’s hot stuff in bed. I later saw this novel referred to as Lady Audley’s Secret in 2oth Century clothes; most apt. While Bedelia left me considerably underwhelmed by the writing style, the plot was reasonably interesting, with a few surprises thrown in. I was curious enough about Caspary and her referenced previous novel Laura (apparently made into a very successful movie, which I confess I have never heard of before) to do a bit of internet research on her. Vera Caspary (1899-1987) had a full and eventful life. After graduating from business college, she worked as a stenographer and in an advertising agency. To support her widowed mother, she turned her hand to projects such as creating a successful correspondence course in ballet dancing, and one on charm and deportment. She went on to work in journalism, and as a successful Hollywood screenwriter, and a best-selling novelist and short story writer. Caspary had strong convictions which she was steadfast in defending; she embraced Communism in its most idealistic form during the 1920s and 30s, but was disgusted by the realties which she found both within the Communist Party in America at the time, and the appalling conditions which she witnessed during a fact-finding visit to Soviet Russia. Despite eventually renouncing her communist sympathies, she was “blacklisted” in McCarthy-era Hollywood and struggled financially during the post-W.W. II years. Caspary was also an ardent feminist who defended her personal views and also her strong and independent female screenplay protagonists against producers’ attempts to sugar-coat them. Vera Caspary is a writer whom I will be giving a second chance to, Bedelia‘s “slightness” notwithstanding. I hope to find a copy of Laura (book and film), as well as Caspary’s autobiography, The Secrets of Grown-Ups, published in 1979. From a quick glance at AbeBooks, it appears that there is are abundant Caspary titles in second-hand circulation at reasonable prices. Not an author I am deeply enthralled with from this first exposure, but intriguing enough to follow up.